Ooooh oooh yes please. 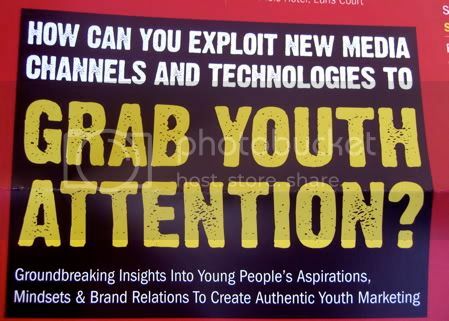 I’d love to know how to grab youth attention using these new fangled new media channels and technologies. Sounds exciting. Damn! I should have guessed, breakdancing kids on mobile phones. The answer was staring me straight in the face all along. These photos are from a marketing pack I’ve just received for a conference. Anyone know where I can get the ‘urban youth cliche clipart vol 7 cd’? I’m searching for a bmx-ing blackberry user and a skater grinding a PSP. That confeence is technically called – Youth Perspective Conference, Engaging Young People Through New Media Channels and Technologies. How do they think that rubbish up? That sounds like a title designed for SEO, but i don’t think they’re that clever. lol, that’s a great poster. 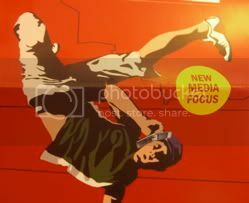 i was just thinking the other day about how many “youth” campaigns these days have used breakdancing images. More than usual, at least here in Canada. If you guys were actual ‘conference design’ critics, your opinions may hold some weight. But since you are all in fact, what is it The Lounge call thamselves?…oh – ‘experiental marketing agencies’, the fact you even took the time to ‘diss’ a competitor is so laughable. You can bet your ingenuity will not go unnoticed….I can see a trend starting here….look out for the summer 2007 Microsoft marketing campaign, ‘APPLE ARE A F***KING JOKE!’ – what a hook! Now that’s experiental, man. Clearly you’re all sad little creatives who have no alternative outlet for your ‘talent’!!! Whatâ€™s even funnier is that surprise, surprise, Layfield is from a youth marketing agency who wasnâ€™t invited to speak at the event! Perhaps he would have a better job if he learned to do his research properly. Hello Sam, firstly calm down, you may blow a gasket. I sorry to potentially upset you further but the conference is a revenue generating opportunity, and not as you might suspect an unbiased gathering of the best brains in youth marketing. The commercial reality is that if youâ€™re not a “sponsor” then you don’t get to speak. So knowledge or insight has absolutely no correlation with who imparts knowledge. That is the whole point of my issue with it. lol, that's a great poster.